Removing a bathroom sink drain involves some tools and a little wrestling. These parts can be corroded and will fight you from removing them. 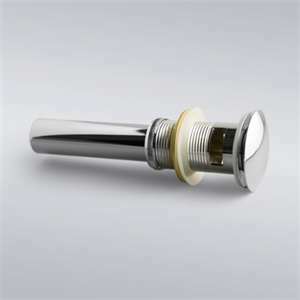 Generally, the only time you will replace a drain assembly is if you are changing the faucet (so the new drain flange looks new as well), or if it is damaged and leaking. The first thing to do is to remove the trap. This unscrews at the slip nuts. From here you will likely need a pipe wrench to hold onto the tailpiece and another wrench to unscrew the nut that holds the assembly to the underside of the sink. Try not to hold the tailpiece at the threads because you may need those threads to get the assembly out. The pipe wrench will mangle the threads. Depending upon which style you have, the flange may screw onto the end of the threads, or the flange may be fixed onto the end of the tailpiece. Loosen the nut and you will be able to see the flange. Once you get the nut down an inch or so, push the assembly upward out of the sink. You can try to grab the flange with pliers and turn the tailpiece to break them free. The tailpiece may also be in two pieces. As a worst case scenario, you can always move the nut down and out of the way, and then cut the tailpiece above the nut and under the sink’s bottom. Then the flange will lift right out.